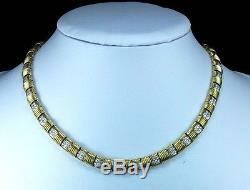 Material: 18 k gold marked, diamonds, 1 ruby on the back close to the signature. Maker's mark, Roberto Coin signature on the back of the necklace. Diamonds are circa 4.50 cts, G color Top Wesselton, clarity VVS1/VVS2 , ruby is circa 0.10 cts. 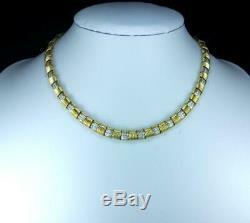 Size: Necklace 17", width just over 2/8", ring size 8 1/2, easily resizable. Date and Origin: Circa 1960/1970 Italy. PLEASE SCROLL DOWN FOR MORE ENLARGED PICTURES. A more than fantastic set, necklace and earrings signed by Roberto Coin, one of most famous Italian jeweler. 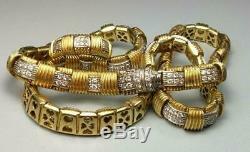 The set is made of solid 18k gold and mounts hundreds of diamonds. 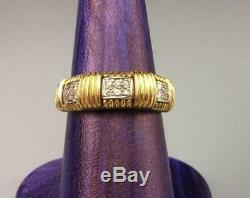 The gold is finely chiseled and enhanced by brilliant cut diamonds. The back is spectacular too, all perforated with a work of small hearts. A small plaque engraved with the signature "Roberto Coin" is close to the clasp on the back. 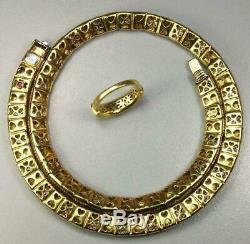 18 k gold hallmarks on the necklace and on the ring. This set has a substantial weight of 76.9 grams, offered here at a fraction of its real retails price. A more than fabulous signed gold and diamonds set, absolutely to not to be missed. TO READ HOW MY LAYAWAY PLAN WORKS. Special Notes As a rough guide United Kingdom is about 5 hours ahead of the United States East Coast and 8 hours ahead of the United States West Coast Please keep this in mind if you should have any last minute question about an item listed, thanks. The item "RAREST GOLD AND DIAMONDS NECKLACE AND RING SET BY ROBERTO COIN -LAYAWAY WELCOME" is in sale since Tuesday, May 27, 2014. 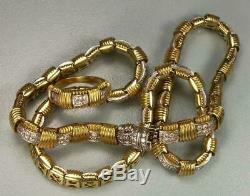 This item is in the category "Jewellery & Watches\Vintage & Antique Jewellery\Vintage Fine Jewellery\1950s". 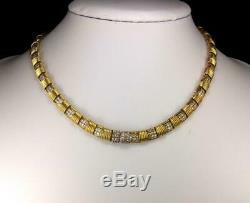 The seller is "antiquecameosltd" and is located in London, London. This item can be shipped worldwide.